The image captured by the Event Horizon Telescope, a network of radio telescopes, proves many predictions about black holes but leaves some vital questions unanswered. The breathtaking, first-ever close-up image of a black hole that European Space Agency scientists have released is described by experts as amazing. Live Science quoted Eric Bonning, an astrophysicist and black hole researcher at Emory University, as saying, "From a scale of zero to amazing, it was amazing." The black hole is located at the centre of a supergiant Virgo galaxy some 55 million light years away from the solar system. An international network of radio telescopes called Event Horizon Telescope confirmed many predictions of how light would behave around these dark objects setting the stage for a new era of black hole astronomy, scientists say. 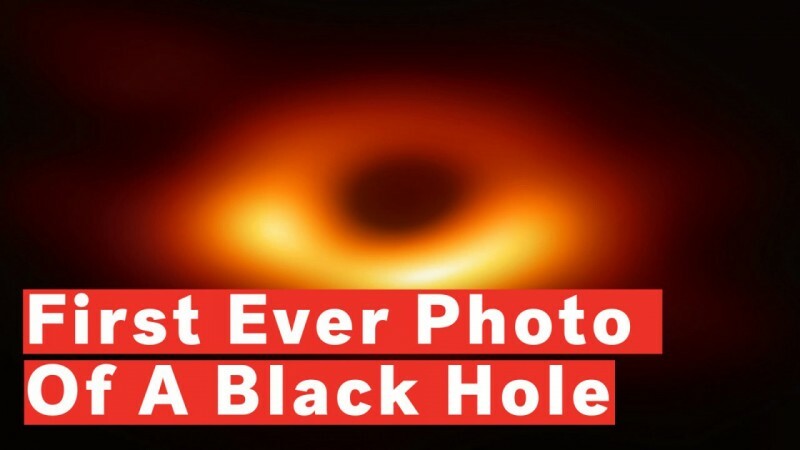 (Event horizon is the extreme point while approaching a black hole where massive gravitation pull makes a return impossible for everything including light.) The image matched the illustrations of black holes in science and pop culture, Live Science writes. The big difference was that it was a whole lot more blurred. Black holes, popularized by movies and Stephen Hawking's book 'Black Holes and Baby Universes' were predicted by a group of astrophysicists led by Indian American Subramanyan Chandrasekhar, who shared the 1983 Nobel Prize for Physics with William A Fowler "for theoretical studies of the physical processes of importance to the structure and evolution of the stars." Chandrasekhar, whose paternal uncle CV Raman won the 1930 Nobel for Physics for a study of the properties of light passing through a medium, proposed the constant that came to be known as the Chandrasekhar Limit, which theorized that the mass of a white dwarf could not exceed 1.44 times that of the Sun. Larger bodies would be unstable as the electron degeneracy pressure becomes insufficient to balance the star's own gravitational self-attraction resulting in gravitational collapse and evolving into a different type of the stellar remnant such as a neutron star or a black hole. Significantly, the network of cameras that captured the photograph of the black hole included the Chandra X-Ray Observatory (CXO), named after Chandrasekhar. CXO has a space telescope that NASA launched on July 23, 1999, and is sensitive to X-ray sources fainter by a 100th part than the signals that any previous X-ray telescope could discover. Hawking's greatest early-career contribution to physics was the idea of "Hawking radiation" – that black holes are not actually black, but emit small amounts of radiation over time, suggesting that black holes could begin shrinking from energy loss once they stopped growing. Bonning said the Event Horizons Telescope didn't confirm or deny this theory, though not many expected it to do either. All supermassive black holes chew up nearby matter, absorb most of it past their event horizons, and spit the remainder out into space at near light speed in blazing towers astrophysicists call "relativistic jets", the article says. The black hole at the centre of Virgo A (also called Messier 87) is known for its impressive jets, spewing matter and radiation all over space. Its relativistic jets are so huge that they can fully escape the surrounding galaxy, according to the article. While physicists know how this happens in broad terms, the details are still elusive and the image does not throw any more light into the issue. General relativity, which covers very big things like gravity, and quantum mechanics, which covers very small things, are mutually contradictory, according to scientists. Scientists expected black holes where extreme gravity could distort many physical properties to yield some light on this contradiction. The image has failed to move the ball forward. So what did we learn from this image? Bonning says physicists learned from the image that Einstein was right, once again. The edge of the shadow, as far as the Event Horizons Telescope can see, is a perfect circle, just as physicists in the 20th century working with Einstein's equations of general relativity predicted. The result with more immediate, practical implications, according to Bonning, was that the image enabled scientists to precisely measure the mass of this supermassive black hole, which sits 55 million light-years away at the heart of the Virgo A galaxy. It's 6.5 billion times more massive than our sun. The finding could change the way physicists weigh the supermassive black holes at the hearts of other, more distant or smaller galaxies. Scientists of the European Space Agency reveal the first image of a black hole.